Sadly my time as fill-in will come to an end as the clock strikes midnight tonight. It has been somewhat pleasurable posting about utter nonsense on this highly acclaimed blog. I was suppose to write a minimum of five blog posts. I didn’t. I was suppose to write about hats and how they came to be such an important part of main stream culture. I didn’t. I also said that these post would be fun. Overall, my posts hopefully opened your hearts and minds to stuff you already knew. So now I leave you with this. 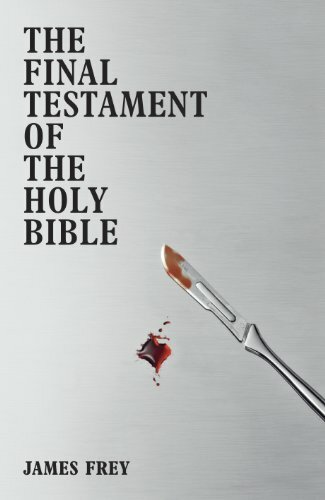 James Frey has written a new book, The Final Testament of the Holy Bible, which has already started a holy war between Frey, Jesus, and the Easter Bunny for who can grab the most attention over the righteous weekend. Due to my lack of funds I was unable to purchase The Final Testament of the Holy Bible yesterday when it was released and resorted to reading the actual bible instead. Looking in the glossary of the bible-yes it is has a glossary-the name James is classified as one of the twelve apostles. Could it be that James Frey is the living reincarnation of James the apostle, placed on earth to write this controversial book about the Messiah returning to the present world? Could James Frey be that person? Probably not. However, Frey’s book sounds amazing. “What if the Messiah were alive today? Living in New York. Sleeping with men. Impregnating young women. Euthanizing the dying, and healing the sick. Defying the government, and condemning the holy. I hate that this guy gets so much crap for some “fabrications” in his memoir/novel A Million Little Pieces. So what if he was in jail for eight hours instead of 87 days. I don’t, but some do. If anyone is interested I am writing a critical essay analyzing the memoir and how Frey’s A Million Little Pieces encapsulates the memoir genre perfectly, and how Mary Karr’s, who has criticized Frey for degrading and destroying the genre, memoir The Liars Club also lays at fault for some minute details surrounding her remembrance of certain incidents that should be criticized as well. Anyways, I highly recommend picking up Frey’s newest book about the second coming of the Messiah. BUY HERE. Also, read The Ghost Writer by Philip Roth. The books surrounds Nathan Zuckerman and his tribulations encasing a story that he publishes about his Jewish Family, and also how he falls in love with a girl that he thinks is Anne Frank. Awesome. Read it while sipping some tea and eating some salmon on rye. BUY HERE. If you don’t like to read or are illiterate you should probably listen to Tv On The Radio’s newest album Nine Types of Light, Panda Bear’s Tomboy, and Fleet Foxes Helplessness Blues. They are QUITE ENJOYABLE. Dont forget to say your silent prayers today sinners. I hope you all get tummy aches from all of the Marshmallow Peeps and Jelly Beans consumed.